Grant H. Dixon, 96, DuBois, passed away Monday, November 26, 2018 at the DuBois Nursing Home. 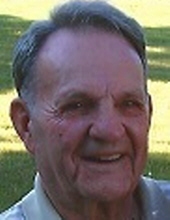 Born July 5, 1922, in DuBois, he was the son of the late John C. and Julia (Schuckers) Dixon. On August 16, 1947, he married Shirley Wining in DuBois. She preceded him in death on July 19, 1996. Grant graduated from the DuBois Area High School in 1940 and later from Penn State in 1948, where he earned a degree in physical education. Over the years, he was employed by Deposit Bank, where he serviced ATM machines, as well as the DuBois Brewing Company. Grant retired from Brockway Glass where he worked in sales as an office manager. During Grant’s time at PSU, he was a member of the Varsity Club as well as earned the title of Eastern Region Intercollegiate Association Wrestling Champion. He loved to repair and build things. Grant was a member of Trinity Lutheran Church. He was a veteran of the U.S. Navy, having served during World War II. Grant is survived by three children, Gail (Thomas) Coulter, Reynoldsville, Gary (Dottie) Dixon, Tampa, FL and Concrete, WA, and Barry “Buck” Dixon, DuBois; five grandchildren; eleven great-grandchildren; one great-great-granddaughter, as well as several nieces and nephews. He was the last member of his immediate family. In addition to his parents and wife, Grant was preceded in death by two brothers and two sisters. Friends and family will be received Friday, November 30, 2018 from 2-4 and 6-8 p.m. and Saturday, December 1, 2018 from 10-11 a.m. at the Adamson Funeral Chapel, Inc. Masonic services will be held by Garfield Lodge #559 on Friday at 5:45 p.m. at the funeral chapel. Following Saturday’s visitation, a funeral service will be held at 11 a.m. at the funeral chapel with Rev. Ben Austin officiating. Military honors will be accorded by the DuBois Area Honor Guard. Interment will be in Morningside Cemetery. Memorial donations may be made to the Disabled American Veterans, P.O. Box 14301, Cincinnati, OH 45250. To send flowers or a remembrance gift to the family of Grant H. Dixon, please visit our Tribute Store. "Email Address" would like to share the life celebration of Grant H. Dixon. Click on the "link" to go to share a favorite memory or leave a condolence message for the family.